I finally got around to dragging all of the photos from my mobile phone last night, and found this little shot that I took in a tacky tourist shop in Berlin. Can I just say… amazing! 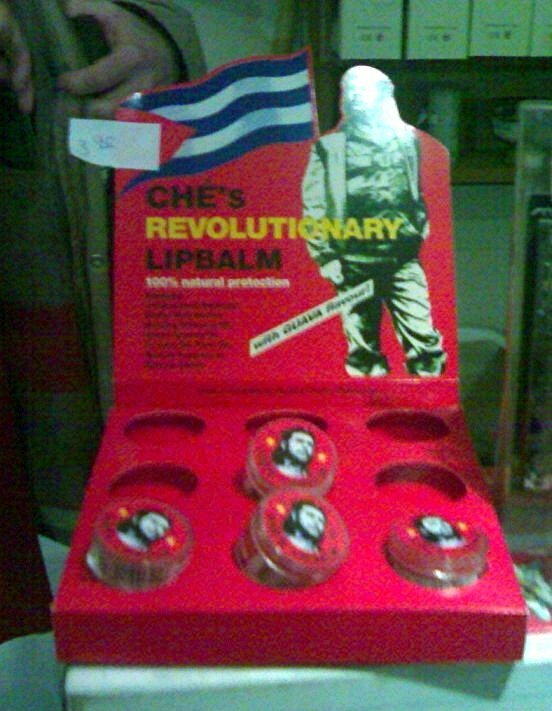 But then I guess every Revolutionary needs their own lip-balm. I am not a fan of Ernesto so I don’t think I will be wearing his lip balm. The only thing that amuses me is that it is being sold in what was formerly East Berlin, and his various dodgy causes won’t benifit even slightly by any sales of this, nor do they from the wonderfully Capitalist use of his image on just about anything that will take it. Actually, thinking about it – I may be wrong. Ernesto Guevara may well have been quite the fan of the capital of Capitalism that is modern America; they are, after all, both huge fans of concentration camps in Cuba. We’ll watch them carefully, inside our golden doors. Thoughts deemed extreme, rebellious or untrue. So onto Cuba, they will go. To keep this young land, pure and clean.